DETROIT — It is sometimes difficult to realize that a lot of what might be construed as who you are is actually a reflection of where you are. Perhaps contemporary gallery spaces embrace the “white cube” concept because it is a great equalizer, reducing wherever you are to the same nowhere space, a blank canvas against which everything becomes venerated, outstanding. But this is Detroit, and it is no blank canvas. 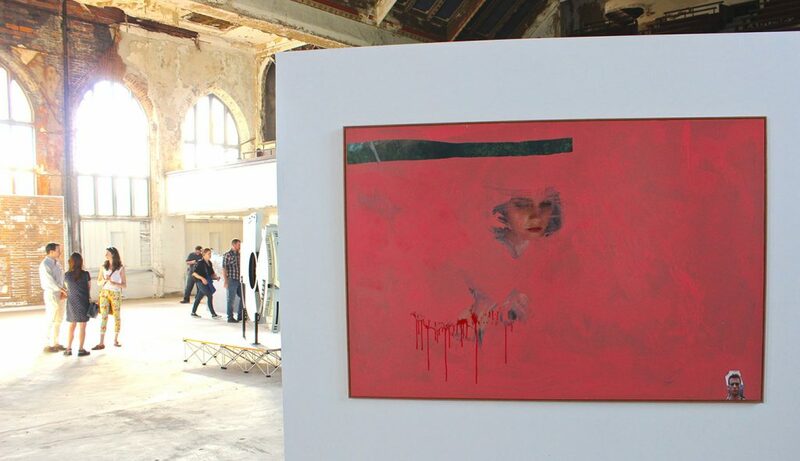 Ostensibly, it was a rejection of the white cube that influential Los Angeles gallery Moran Bondaroff was seeking, as it kicked off its year-long residency in the Detroit space dubbed Cathedral — formerly Woods Cathedral, and built in 1925 as the Visitation Catholic Church. The gallery’s inaugural show, War Games, curated by Benjamin Godsill, featured a coterie of national and international names — Simon Denny, Yngve Holen, Haley Mellin, Yuri Pattison, Oliver Payne, Hannah Perry, Jon Rafman, Chadwick Rantanen, Sean Raspet, Yves Scherer, Hugh Scott-Douglas, and Sean Townley — and one Detroit-based artist, the internationally known ceramic artist Anders Ruhwald. But rejection of the blank canvas is fraught with complications — logistically, aesthetically, and politically — and in viewing War Games, some of those issues became very prominent. Woods Cathedral is a breathtakingly lovely space in its own right, replete with remarkable 100-year-old frescoes, original woodwork, and architectural details in varying states of decay. The quality of light and space in the vaulted main gallery was designed to showcase God’s glory, and, with a few exceptions, the individual works struggled to stand up on such a stage.